There may have been a lack of new signings at the PTS Academy Stadium in the final week of the January transfer window so far, but Cobblers boss Keith Curle is hoping a few familiar faces will be available again for Saturday's clash with Colchester United. Town's preparations have been hit hard by injuries in recent weeks, with the likes of John-Joe O'Toole, Sam Foley, Shaun McWilliams, Dean Bowditch and George Cox all ruled out for various reasons. Loanee Cox is definitely out of this weekend's date at the PTS (ko 3pm) as he recovers from the ankle ligament injury he picked up at Cambridge United, but Curle hinted that two or three of the others could be ready to return. 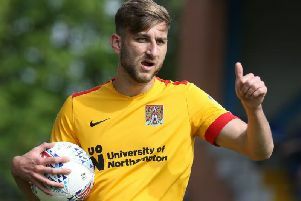 "The injured players are responding well," said the Cobblers boss, who saw his side draw 1-1 with Morecambe move seven points clear of the Sky Bet League Two relegation zone on Saturday. "There are more people coming back now and getting pitch time and training time, so the health of the squad is looking a lot better than it was a week ago, or even four days ago. "In a matter of days the likes of Dean Bowditch, JJ and Foley will be ready for selection again, and I would arguably say two out of three of those will be ready for this Saturday." Curle confirmed that he, along with chairman Kelvin Thomas and chief executive James Whiting, will be busy today trying to get new signings over the line ahead of the 11pm deadline for business on Thursday night. But he also stressed that if the club can't get the players they are targeting, then they won't be panicked into deals they don't need to do as the Town boss is confident the squad he already has at his disposal is capable of comfortably securing the club's league two survival. "As we sit here now if we got all the injured players back, and they are not far away, then we have got a very competitive squad," said Curle. The Cobblers stayed in 17th place in the league two table on Tuesday night. Port Vale missed the chance to leapfrog Town as they drew 0-0 at Newport County. Elsewhere, former Cobblers loanee Lewis Ward made his Football League debut as he entered the fray as a 61st-minute substitution for Forest Green Rovers in their 1-1 home draw with Mansfield Town. Ward spent the first half of the season at the PTS, but was sent back to Reading earlier this month before being immediately loaned out again to Mark Cooper's side.